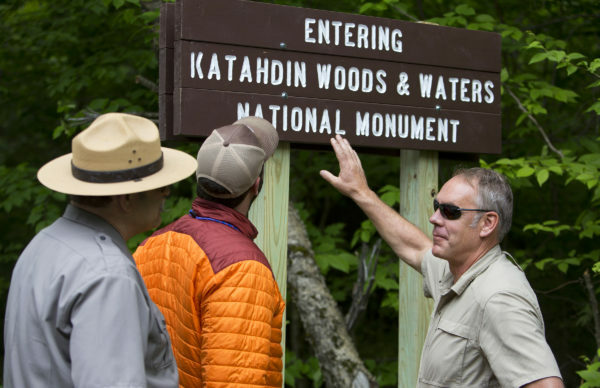 U.S. Secretary of the Interior Ryan Zinke (right) looks at the sign for the Katahdin Woods and Waters National Monument with Lucas St. Clair (center) and superintendent of Katahdin Woods Tim Hudson during in June. Last Friday, Interior Secretary Ryan Zinke said he has removed Canyons of the Ancients from the list of 27 national monuments he had been asked to consider for modification or nullification by President Donald Trump. Zinke said he was recommending that no changes be made to the Colorado national monument because it is “gorgeous” and contains many Native American archeological sites. He had previously said that Craters of the Moon National Monument in Idaho and Hanford Reach National Monument in Washington were no longer under review and should not be changed. “When the President and I began the monument review process we absolutely realized that not all monuments are the same and that not all monuments would require modifications​,” he said in a statement about Canyons of the Ancients. For similar reasons, Zinke should also recommend no modifications to Maine’s Katahdin Woods and Waters National Monument. And, he should do so now, not weeks from now, so the rural region can focus on building on the momentum the new monument has created, not worrying about its status. Zinke visited the monument in June and was clearly impressed.“If this [view] is an indicator, I’ll be pretty happy,” he said on June 14 as he and his staff posed for photos at an overlook that offers sweeping views of Mount Katahdin and Katahdin Lake. He said that he understood that everyone loved the land and wanted access to it. He also spoke of the monument’s growing importance to the local economy. “I’m comfortable, certainly, with it in public hands,” Zinke said. Scaling back the size of the 87,500-acres monument didn’t make sense, he told reporters. The next day, Zinke said he might recommend that the Maine monument become a national park. This would take an act of Congress and can’t be done unilaterally by the Department of Interior. At a Senate Energy and Natural Resources Committee hearing in June, Zinke told Sen. Angus King that he, and monument opponents, would be “ enthusiastic” about his recommendation. Last week, Zinke announced that $50 million would be devoted to infrastructure work in national parks. The money is a mix of federal and privately raised funds. Acadia National Park is set to receive more than $450,000 for trail work. One of the frequent criticisms of new national monuments is that they add to the backlog of deferred maintenance in the national park system. This is a valid criticism, but Katahdin Woods and Waters National Monument won’t add to that burden. In addition to donating the monument land to the American people, the Quimby family included a $40 million endowment for its operation and maintenance. From his comments, it appears Zinke has already formulated a recommendation. As he has with other monuments, he should share that recommendation now. Local residents, business owners, monument visitors, local and state lawmakers and others deserve to know what changes, if any, the Trump administration is considering. More people are visiting the Katahdin region — spending money at local hotels and restaurants. New businesses have opened, real estate is selling and there is, finally, a positive energy. Opposition to the monument designation is waning. The review of the new national monument has dampened this enthusiasm. There is no reason to keep that cloud of uncertainty over the region. Zinke can lift it now by making his determination public.